The BIG NEWS this month is that Rews are coming back to Birmingham, finishing of their England tour with a special gig at the Hare & Hounds on Thursday 22nd March – joined by an awesome local line up, Tamworth’s garage rock two piece You Dirty Blue and Birmingham’s rising balloon punksters P.E.T. Still out smashing holes in radio playlists and the right kind of ear drums across the country, Rews are back on the road (do they ever stop!?!?) with their debut album Pyro – a rock pop stonker which we thoroughly suggest you check out. Read my Birmingham Review of the ten track beast here, or cut out the middle person and just get yourself a copy. You can bill me if you’re unhappy. But Rews are a step up live. And don’t just take my word for it, ask any of the following: Hew Edwards, Mark Radcliffe, John Kennedy, Scott Mills, Alice Levine, Dev, Greg James, Scott Mills, Clara Amfo, Adele Roberts… (and that’s just the beeb). Or anyone who’s seen them play. Or Google. It’s not a difficult cross reference. Of course, the best way to know for absolute certainty is to come and see Rews at the Hare & Hounds on 22nd March – for direct gig info and links to online ticket sales, click here. Or to can hop over to the Facebook event page for updates, info and links aplenty – click here. WARNING – CONTAINS CIVIC PRIDE: Rews have bolted Birmingham onto their England tour dates because their last gig in the city was such a stormer – Birmingham loves Rews, and it seems there’s a little mutual flutter there too. 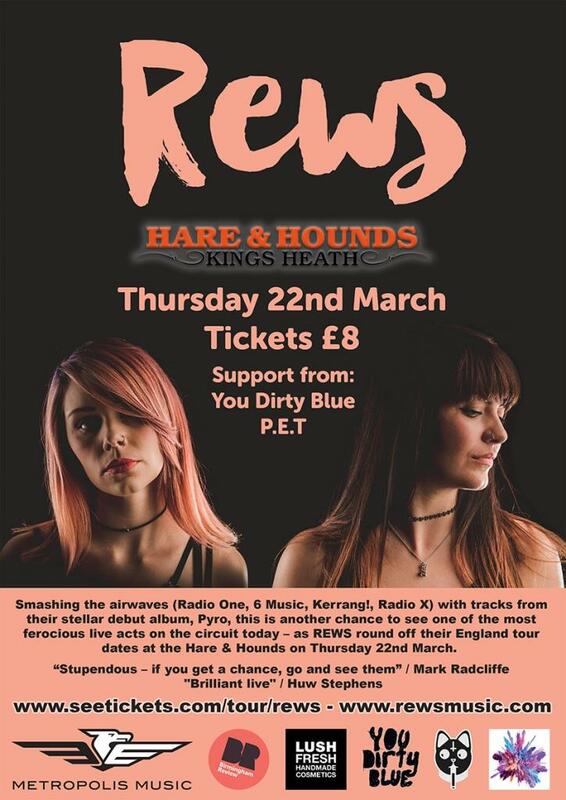 So, come down to the Hare on 22nd March, enjoy an awesome gig from Rews, You Dirty Blue and P.E.T, and stand on for your local live music scene. BRUMMIES UNITE. And breathe…. There are other gigs this month, some pretty high profile shows too. 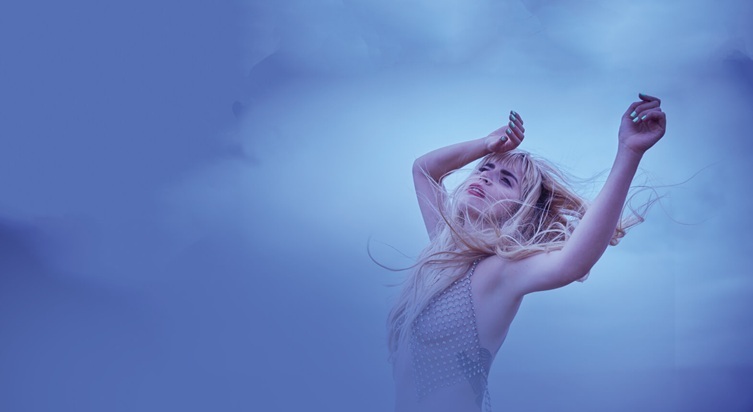 In the land of five figure crowds, the Genting Arena hosts All Time Low (15th Mar) and the resplendent resurfacing of Paloma Faith (21st Mar). Whilst at Arena Birmingham we see some of America’s A-Lists rock with Fall Out Boy (27th Mar) and 30 Seconds to Mars (29th Mar). So, that’ll keep you busy. And a little broke. Editors play an ‘intimate’ gig at the Town Hall (4th Mar) to showcase their new album, Violence. Whilst across town Hookworms headline at the Hare & Hounds (4th Mar), and across the road Amit Dittani introduces his debut solo album, Santiago, at the Kitchen Garden Café (4th Mar). 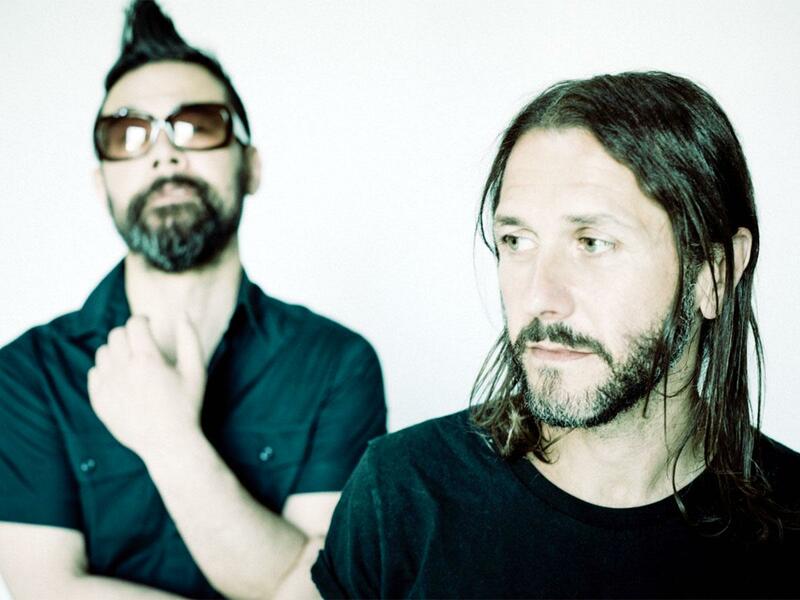 Elsewhere in the city, Ezio return to Birmingham but this time at the Kitchen Garden Cafe (7th Mar), Astroid Boys tour their debut album, Broke, at The Asylum (1th Mar), Feeder take us on a retrospective love in at the O2 Academy (14th Mar), Joan Baez celebrates the end of a near 60 year live career as her Fare Thee Well Tour comes to the Symphony Hall (14th Mar), The Stranglers come to the O2 Academy (17th Mar), ‘First Lady of Celtic Music’ and Clannad family member Moya Brennan plays at the Glee Club (20th Mar), whilst Rae Morris brings a sneak peak of her sophomore album, Someone Out There, to the O2 Institute (21st Mar). Phew… can anyone lend me a tenner? 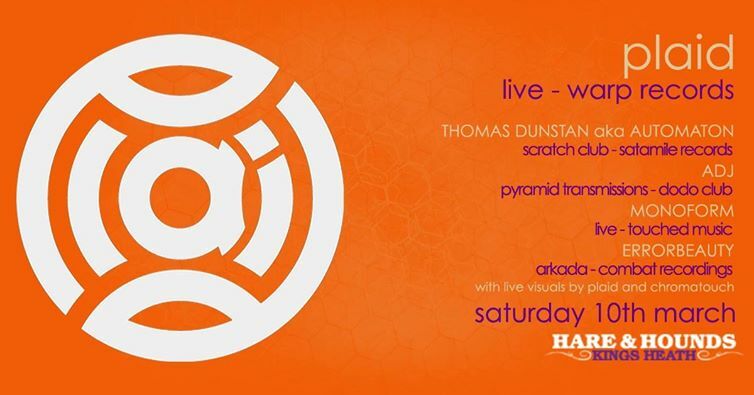 And so exciting it gets it’s own paragraph, electronic music pioneers, Plaid, bring their AV tour to the Hare & Hounds on 10th March. A pivotal piece in the EDM jigsaw, Plaid come back to Birmingham after their sell out gig in the city last year – if this show doesn’t pack out then there’s something inherently wrong with the world, so we would suggest getting your Warp loving wriggle on and buying a ticket or two quick smart. For direct gig info and online ticket sales, click here or on the relevant hyper link. A little later in the month the same promoters, Scratch Club, are putting on a breaks, beats and hip hop free bash at One Trick Pony with Dr Syntax (The Mouse Outfit, Foreign Beggars) & Pete Cannon, joined by Birmingham’s own DMC champion Mr Switch (30th Mar). For free..!?!? Now that’s a good bloomin’ Friday. Film is stomping is size 10s across the city too, a cheeky month before Flatpack #12, with a healthy collage of celluloid (well, probably digital now) coming to screens in a variety of Birmingham venues. Ruben Östlund’s takes a well-penned stab at the pretensions of class and art with The Square – on general UK release from 16th March, before coming to The Electric (23rd Mar) and mac (30th Mar). Whilst mac programme a centennial celebration of Ingmar Burgman with The Seventh Seal (16th Mar), The Touch (17th Mar) and Persona (18th Mar). The Mockingbird hosts a Wes Anderson Marathon (18th Mar) featuring The Royal Tenenbaums at 12noon, Life Aquatic with Steve Zissou at 2:30pm, Fantastic Mr Fox at 5:00pm and The Grand Budapest Hotel at 6:45pm. Bit of a welcome refresher course before Anderson’s latest (and animated) feature, Isle of Dogs, is out on general release from 30th March – with two preview screenings at The Electric (25th Mar) if you wanted to jump the gun a little. The Mockingbird are also showing the eponymous biopic about the notorious fashion designer, Westwood, throughout the month. 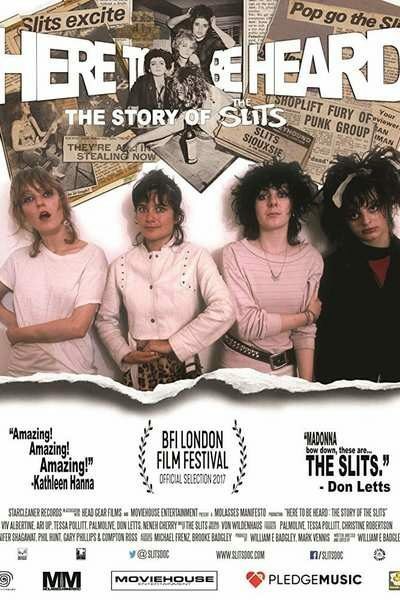 But we recommend you wait until 26th March, so you can jump straight into Here to be Heard: The Story of The Slits – another biopic, but this time about an altogether more altogether slice of formative female punk. 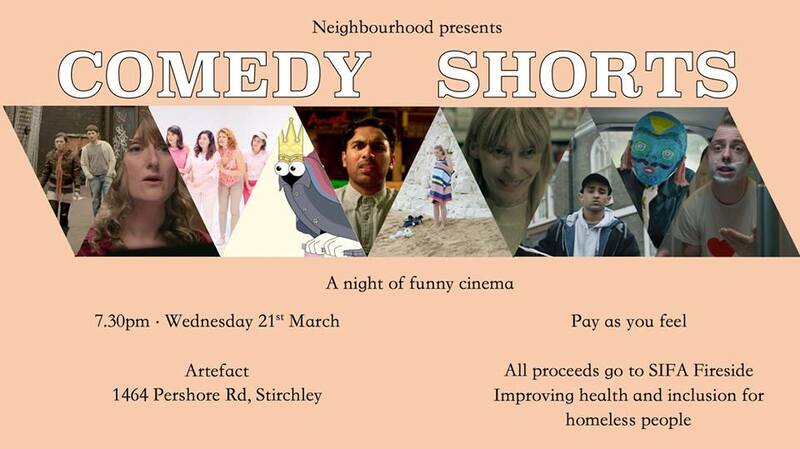 On the city’s smaller silver screens this March, Neighbourhood present a series of comedy shorts at Artefact in Stirchley (21st Mar) – with a pay as you feel fundraiser for SIFA Fireside, a Birmingham based organisation who support ‘those experiencing homelessness or who are vulnerably-housed.’ A great charity that deserves our cash and consideration; look outside, now pay what you feel. Elsewhere, The Victoria welcomes the rescheduled Birmingham Horror Group: Mini-Movie Marathon (25th Mar) which is also fundraising – this time ‘with proceeds from ticket sales going to the medical charity Diabetes UK’. Whilst the Kitchen Garden Café screen the Arnie body count craziness and all round awesome… Predator (20th Mar) – which we are more than a little happy about. I’m off to buy a dog eared cigar, dog eared dog tags, and practice the film’s profound script such as, “if it bleeds we can kill it”. Powerful stuff Arn, Kierkegaard? Treading the boards this month, Joe Black starts the UK run of his new show, Touch of Evil: A Celebration of Villainy in Song, with two nights at The Old Joint Stock (09-10th Mar). The Birmingham REP stages fingersmiths’ rewrite of John Godber’s Up’n’Under (12-14th Mar) – a play about pride and adversity (and rugby, to be fair) which has been adapted for all audiences ‘with a cast of Deaf and hearing actors using British Sign Language and spoken English’. Overlapping a little bit, REP also present The Kite Runner (13-24th Mar) performed in venue’s main theatre, coming to Birmingham after ‘an outstanding’ run in the West End. Then back in the ‘burbs, The Wardrobe Ensemble present their tale 90’s nostalgia and the Blair honeymoon – Education, Education, Education – at mac (20th Mar). On the more glamourous side of town, Alyssa Edwards’ The Secret Is Out Tour saunters over to the Glee Club (7th Mar), before BCU’s Burlesque society present Dare to Desire at the Bierkeller (15th Mar) and Scarlett Daggers brings The Gilded Merkin burlesque show back to the Glee Club (18th Mar). 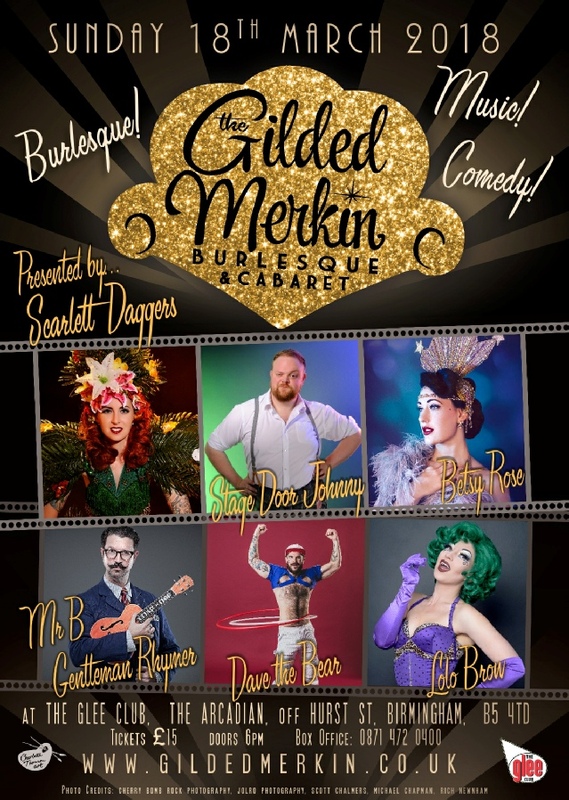 Not far behind is Ben DeLaCreme, with her ‘terminally delightful’ show coming to the Glee Club (29th Mar) – a day before Klub Kids present The Twisted Circus in all its glitz and glory at the O2 Academy (30th Mar). Comedy has a pretty decent crack of the whip in March too, kicking off with Russell Brand’s Re:Birth at Symphony Hall (8th Mar) before the Glee Club takes the reigns until April, with Phil Wang (11th Mar), John Robbins (21st Mar) and Tiff Stevenson (23rd Mar). Across town and the space-time continuum, Rupi Kaur presents an evening of performance poetry the Town Hall (24th Mar) including work from her recently released second collection, The Sun and Her Flowers. Then just shy of a week later, Richard P Rogers rounds off the month with his Frank Cook and the Birmingham Scene exhibition at mac’s Community Gallery (30th Mar) – a study of the titular Ladywood artist, as he worked his way from the north Birmingham back to backs to art school in London in the late 1960’s. Right then, a fair amount happening in March – I’m off to do some diary/bank statement cross referencing. And maybe drink a glass of wine, or two. What day is it again…? For more on any of the events listed here, click on the highlighted hyperlinks. Ed King is Editor-in-Chief of Review Publishing, which issues both the Birmingham Review and Birmingham Preview.